A little article in the January/February Atlantic explains how a fellow has introduced small pieces of iron for rural Cambodian people to put in their cooking pots as a way to combat iron deficiency, which affects roughly half of Cambodia’s children and pregnant women. He found great success once he had the iron pieces fashioned into the shape of a smiling replica of a type of fish the locals consider a symbol of good luck. This illustrates the importance of trace elements for our health. That’s one of the key reasons we recommend ‘classic’ filtration over reverse osmosis. Classic filtration leaves needed trace elements in the water, supporting health. It’s also interesting how too much of many things can hurt us, while appropriate amounts will help us. Lots of the serious articles about the importance of trace elements in your drinking water cost money. If you are sufficiently interested, just do a search and you’ll see them. However, we believe it makes great sense that these elements, needed for nutrition, should be in our drinking water. We believe in Mother Nature. We have seen those who think trace elements aren’t absorbed when drinking water, but quite simply don’t believe it. We’ve also read research showing that over the long term, taking supplements will partially offset damage done by not having trace elements in your water, but supplements can’t fully replace natural absorption from drinking water. 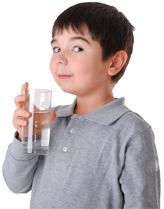 See the kitchen filters at friendsofwater.com for affordable, effective filters to support your health.